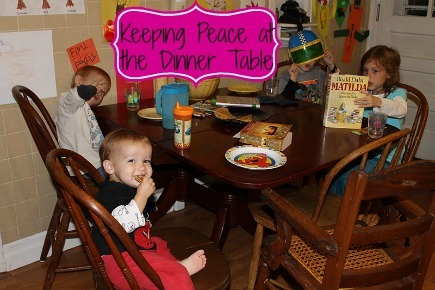 Have you ever had a night at the dinner table where chaos reigns? Children are squabbling, parents are tense, milk is spilled, tears are shed, and sanity is called into question. Maybe your table is too small and you need to get a dining table and 6 chairs instead of the 4 chairs that you have at the moment. That’s an accurate description of our table almost every single night. It’s a very rare evening where our dinner table resembles a Norman Rockwell portrait. Sometimes I just have to throw my hands up in the air and give up completely on the idea of a traditional peaceful dinner time filled with conversation and chit chat about the day. Sometimes we just need to mix things up at dinner in order to keep the peace. Here’s a list of ideas for changing things up at dinner and avoiding the dinner time chaos. Ask Questions & Lead the Discussion ~ The dinner table doesn’t have to be a democracy. Go ahead and become a dictator and take control of the conversation! I start dinner with a simple question, “What was the best thing that happened to you today?” and then we go around the table taking turns answering the question. Sometimes we follow it up with “What was the worst thing?”. Both of these are great conversation starters. My Mama taught me the fine art of finding out how your child’s day at school was by asking these questions. When we go around the table asking this question everyone else has to listen respectfully. I mean, they can ask questions if they’d like, but we discourage disruptions and interruptions. This way everyone gets their chance to have the spotlight and share about their day. The other way I “dictate” our conversations is to pick an interesting topic, throw it out there and then let the kids take turns giving their opinion or thoughts on the matter. We have had some interesting conversations about healthy foods, history, local current events, and even religion & politics have popped up in our conversations. I know it sounds terrible to say you should take over the conversation, but anyone who has dined with my four children all clamoring to be heard at once knows why I say this. There’s nothing wrong with having an “organized” conversation. Read Books ~ And then there’s nights when talking is over-rated. There, I said it. Sometimes I just want to have peace and quiet while we eat. My children chatter at me constantly throughout the day, so I don’t feel like I’m doing any damage when I allow reading at the dinner table. Just the opposite…I’m encouraging them to read whenever they possibly can. And then after dinner we talk about what they are reading. Plus, when we read at the dinner table they see Michael and I read and that shows them that we have a great appreciation and love for literature. For more ways to encourage children to read you should read this post: “A Passion For Books: Encouraging Young Children to Read“. Ask Trivia Questions ~ We did this a lot last year when Ella was on the Academic team at school. It’s another way to “guide” the conversation at the dinner table as I discussed earlier. PLUS it teaches them interesting facts and maybe even helps them study for upcoming tests. Make learning fun by bringing the whole family in on it! Dinner Table Drawing by Wendolonia ~ This idea is so creative and sounds like a lot of fun! I haven’t done it yet, but it is an idea I pinned for later because I think my creative family would love this. Change Things Up ~ Maybe your chaotic dinner just needs a change of scenery. How about dinner in the back yard? Or in the dining room instead of the kitchen? Or for a special treat how about a picnic dinner on the living room floor while watching a movie? Or you could mix it up entirely and cook your dinner over a campfire. How do you keep your dinner table from turning into a scene from Animal House? With my kids being older we don’t really have these issues any more but I always found engaging them in conversation worked best.